There is something I've always wanted to learn to do. Free motion quilting. I have myself a Craftsy Unlimited subscription intending to watch more cardmaking classes and cooking classes and soon ended up in quilting. All this is to say that I've been mildly obsessed with making an improvisational quilt (from one class) and learning to free motion quilt it (from about 4 other classes). So I just haven't done a lot of papercrafting. Finally I got some photos printed and I'm pleased with this two pager is a two pager. 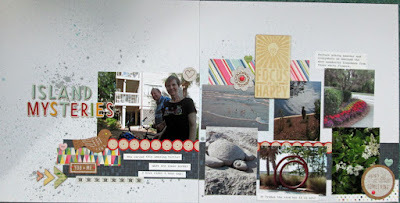 We went to Hilton Head Island a few weeks ago before monsoon season hit, fortunately. This is one of those 'around the island' collages of various things we saw. Many of them were biking but a couple from the beach. 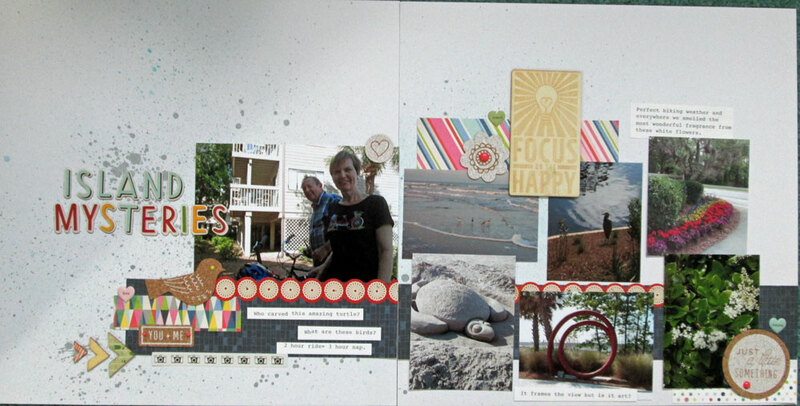 I've used items from two different paper collections and lots of embellishments. I even broke out the mist. Mist is something I like when I remember to use it and it actually still sprays. It is not something though I want to further invest in. When what I have is gone or stops spraying, it's gone. I'm short on space. Thanks for waiting patiently for a new video. I'll try to get some more things up soon. Did you see my Vlog video? It's sort of an 'around the craft room' video likely weekly or bi-weekly just to show what I'm working on. It could be sewing, knitting or papercraft or even cleaning out stuff. Thoughts? Great LO Lisa! Love the mist background - I always forget about my mist! And I love that all those photos were things you had questions about!